This page is written by the game's inventor, Tony Quintanilla. This game is a favorite of its inventor. 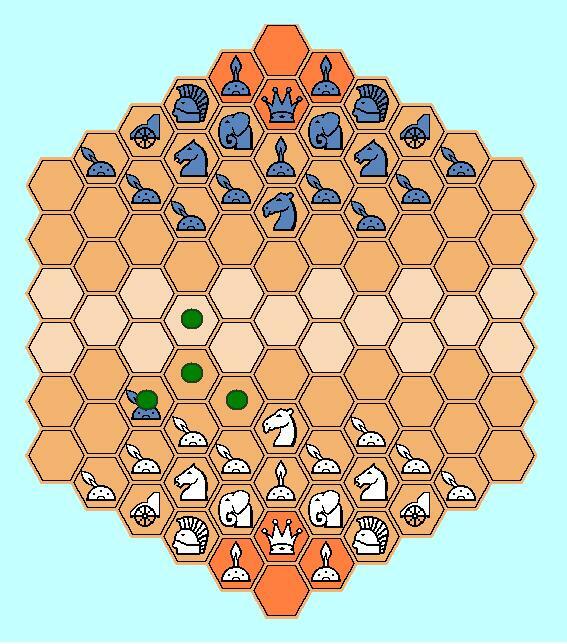 The original variant of Heroes Hexagonal Chess was created for the 84-Space Chess Variant Contest held by these Chess Variant Pages in 2002! 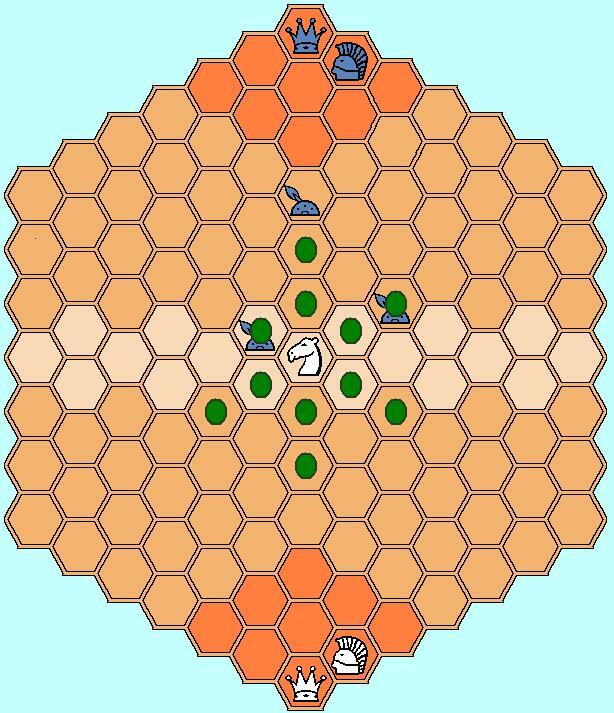 That game was specifically designed to play on an 84-hex board, which has its own unique features, especially a "non-hex" in the center. The idea behind Heroes Hexagonal Chess was to create a new variant in a hexagonal board, but without trying to replicate FIDE chess moves. I came up with new moves for the pieces, but with some connections to traditional Chess moves. 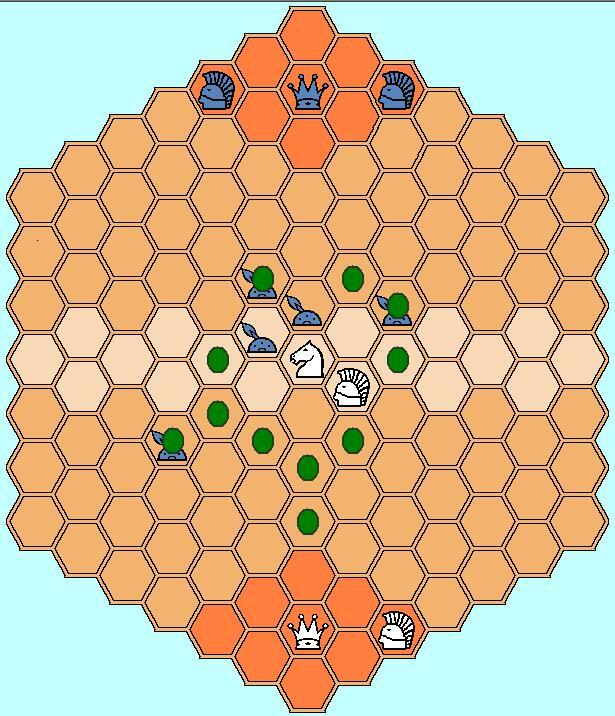 The theme behind the name of this game is that the Hero is royal in two ways: one cannot loose all one's Heroes and win, and also the Hero and the King give special moves to friendly pieces they are next to. 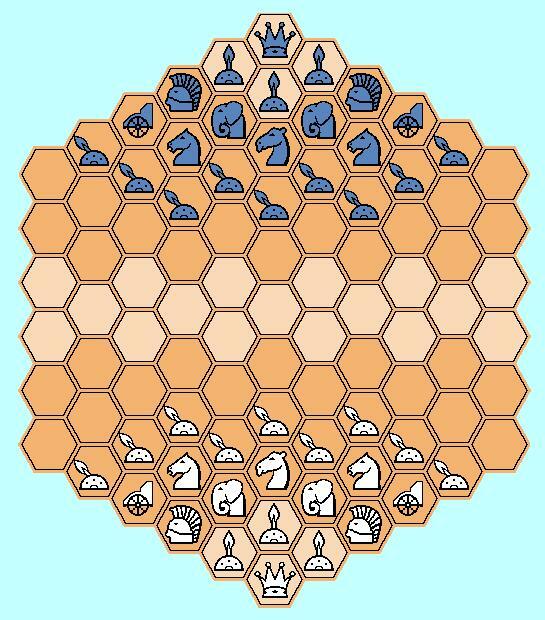 I created this new variant of Heroes Hexagonal Chess to take advantage of all the 91-spaces of the hexagonal board with 6 hexes to the side, which is also the board used by the most well-known hexagonal variant, Glinski's Hexagonal Chess. I also wanted to simplify the Pawn and increase the power of some of the pieces to make them more interesting. Hopefully I have achieved a good balance. I have found that Heroes take about two to three times as many moves as FIDE Chess to finish. Both the tactical and strategic considerations are important. Tempo is important. This is because the board is large and the piece ranges are relatively short. A material advantage gained by good tactical combinations can be crucial in winning the game. A balanced end-game will be drawish, but even a small material advantage can win. Strategic commitment of pieces can create conditions for winning combinations. Be careful about unequal exchanges since each piece has its unique qualities, especially exchanges of Chariots for Heroes, or Knights for Camels. This game is played on an 91-hex board. The initial setup is as shown below. The graphics below show the moves. 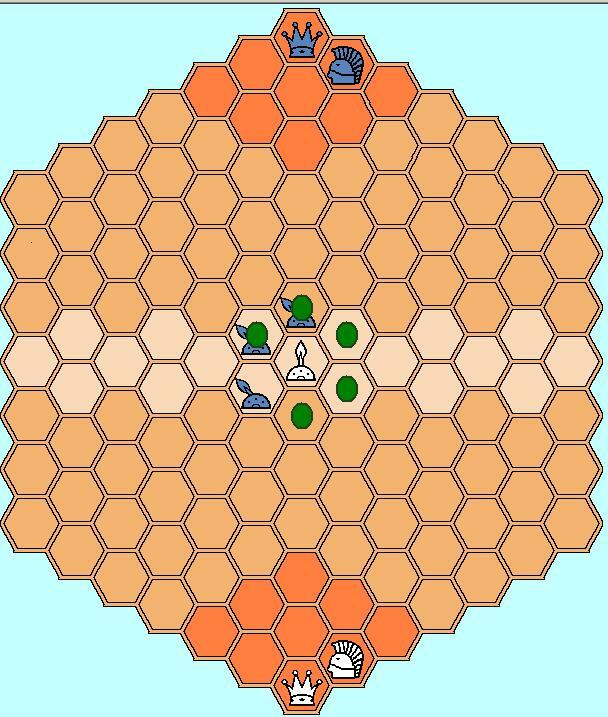 Note that some graphics currently show the moves on a larger board than the 91-hex board used in this variant. These graphics were made using Zillions of Games. The King strongly resembles the traditional Chess King, going back to Shatranj and into modern Chess, and most variants. It retains the single space move in all directions. It has added powers in that it can enhance the moves of other pieces, being royal, like the Hero. 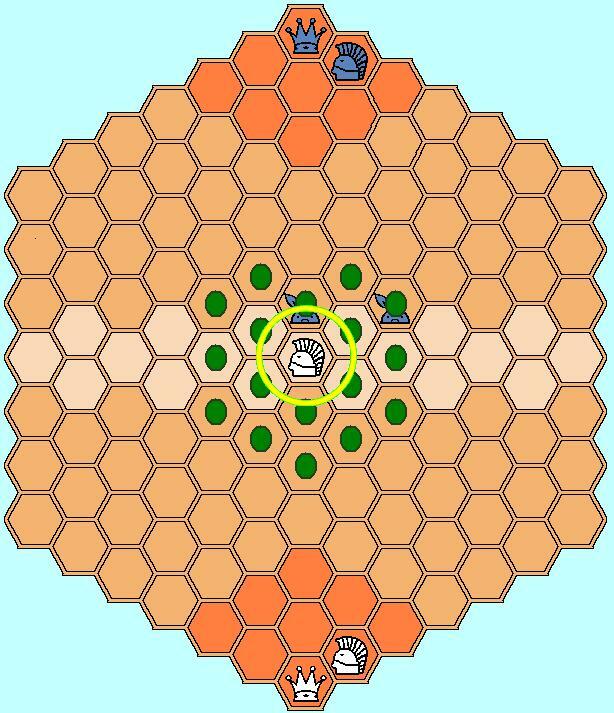 It can also win by entering the opposing promotion zone, like a King capturing the enemy stronghold! It can play a crucial role in end games where the material is very similar, just as in traditional Chess. Note that the graphic I have chosen for the King is one usually reserved for the Queen. If fact, one can think of this piece as either a King or Queen -- the sovereign of your kingdom! As in most variations of Chess, if your King is in checkmate, you loose the game! 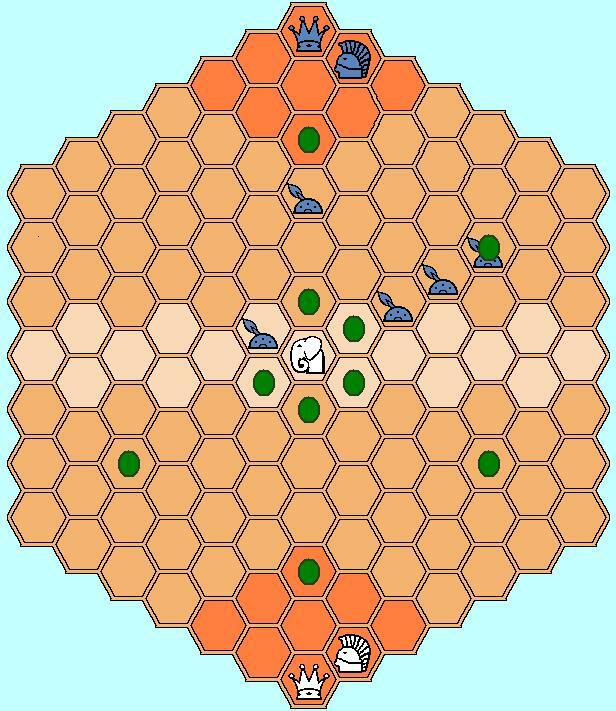 The Hero may move away one or two hexes in any direction, including different directions. The Hero may not jump over any intervening pieces. The Hero is a new piece, but it does harken back to the Chess Queen or the Wazir or General in Shatranj. It could be thought of as a kind of prince or general. It is very powerful, arguably the most powerful piece in the game, along with the Chariot. It has the added ability to enhance the moves of other pieces, being royal, like the King. Harkening back to its royal quality, is also necessary to avoid loosing all your Heroes to avoid defeat! The Chariot may move up to five hexes in any of the six directions away from its hex. The Chariot may not jump over any intervening pieces. The Chariot strongly resembles the traditional Chess Rook or Chariot in Shatranj. It has the traditional straight move, although limited to 5 hexes. This movement limitation is the major departure. It is a semi-royal piece in that it cannot be enhanced by the Hero or King. It is very powerful, particularly in the end game, by its mobility. Arguably it is as powerful as a Hero and should not be casually traded for a Hero without first considering its mobility. The Knight may move two or three hexes in any of the six directions away from its hex. The Knight may not jump over any intervening pieces. The Knight differs substantially from the traditional Chess Knight. Most of its move is straight. 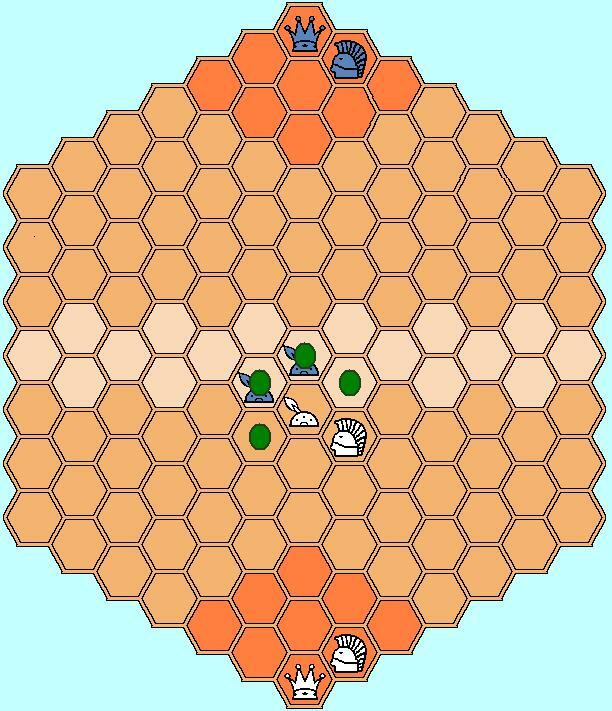 This is a feature of the hexagonal board. However, it does resemble the Chess Knight in one regard: its Hero-enhanced move allows it to jump over other pieces and move in alternating directions. This ability can be handy in closed positions, particularly in the early middle-game. The Camel may move up to two hexes in any of the six directions away from its hex. The Camel may not jump over any intervening pieces. 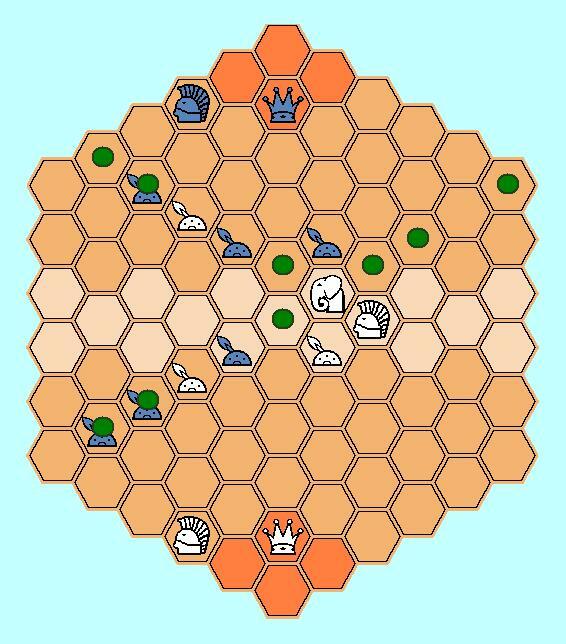 If the Camel is adjacent to a friendly Hero or King, the Camel may move up to three hexes in any of the six directions away from its hex. The Camel is a completely new piece. It is meant to complement the Knight's move. It is about as strong as a Knight, possibly just a bit stronger, due to its ability to capture in the first hex. The Elephant may move one hex in any of the six directions away from its hex. When using this move, the Elephant does not capture and may only enter an empty hex. 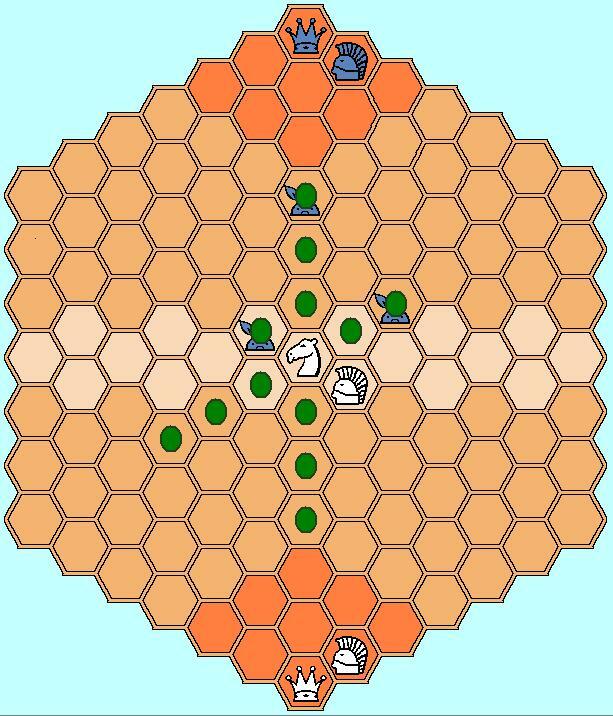 To capture, the Elephant may move exactly four hexes, or up to the edge of the board, in any of the six directions away from its hex, as long as the first hex is empty. The Elephant jumps over any intervening pieces, whether opposing and friendly. The Elephant captures any piece it lands upon, whether opposing or friendly. It also captures any intervening pieces it jumped over, whether opposing or friendly. Finally, the Elephant itself is removed from the board and replaced with a Guard. If the Guard is created in the Guard's promotion zone, it is promoted to Hero immediately! The Elephant is also a completely new piece. Of course, there is an Elephant in Shatranj and the Bishop in Chess, however, there is little resemblance. The idea behind its unique move is the function of the Elephant: a heavy shock unit that had little consideration for what was in front of it. At the end of its charge, the Elephant was prone to go out of control and become ineffective. I allow the soldiers on the Elephant to "jump off" at the end by replacing the Elephant with a Guard. The Elephant is more effective as a threat than as an exchange piece. When next to a royal piece, it can control the files with the threat of massive damage. But it is a one-shot threat! Use it wisely! If you are able to retain an Elephant into the end-game, it can be a powerful threat on the enemy promotion zone, threatening to promote its Guard to Hero and quickly win the game. In this regard, one could also think of an Elephant as a kind of war-engine. The Pawn may move one hex in any of the three forward directions, if the hex is empty, without capturing. When making its first move, the Pawn may move directly forward two hexes instead, if they are empty. Or, the Pawn may move forward one hex to the left or to the right and capture any enemy piece present. 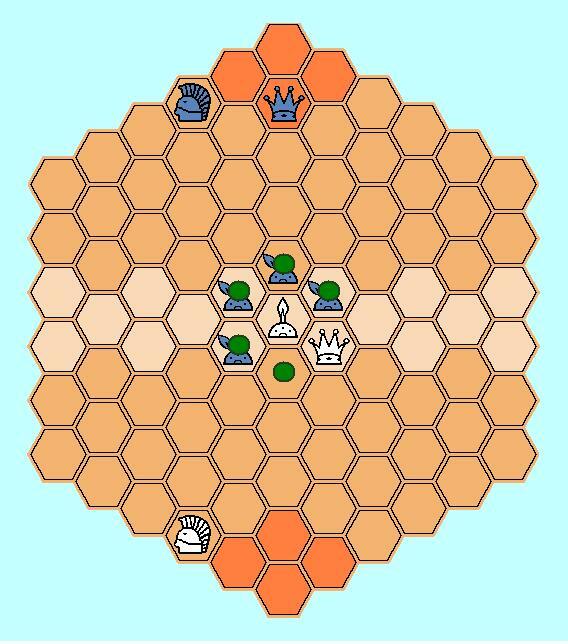 If the Pawn is adjacent to a friendly Hero or King, it may also move one hex backward to the left or to the right, if the hex is empty. Or, if moving straight forward, it captures any opposing piece it lands upon. If a Pawn moves into the opponent's side of the board, past the center hexes marked by different color, it promotes to a Guard. If a Pawn moves adjacent to an opposing King it promotes to a Hero immediately -- creating a mortal threat to the King that can only be escaped by capturing the new Hero! The Pawn also resembles the Shatranj and Chess Pawn. It moves forward, but captures laterally. It also has the initial double move of the modern Pawn. However, when enhanced by a royal piece, it acquires the new ability to retreat. The Pawn also retains its traditional ability to promote, although its promotion is limited to a Guard or Hero. This resemble the promotion limitation in Shatranj to a Wazir or General. The Guard may move and capture an opposing piece in any of the three forward directions. Or, it may move in any of the three backward directions without capturing. If a Guard is next to a Hero or King, it may also capture when moving backward to the left or right, but not directly backward. If a Guard moves adjacent to an opposing King or enters the promotion zone at the far end of the board, it promotes to a Hero, just like the Pawn. The Guard is also a new piece, although it does resemble the Shatranj Wazir in some respects. The Guard is a Pawn that has more abilities. The Guard next to the King or Hero is very powerful. In fact, the King can defend itself against any assault with its Guards, as long as it has one-to-one parity in material and is in its home promotion zone, where it is protected -- like a King in his stronghold! Guards come into play more in the end-game, when the material balance is crucial and the threat of promotion becomes more real. Be careful to protect your far-flung Pawns and Guards in the end-game from ranged pieces! Victory Conditions: To win, checkmate your opponent's King or capture all your opponent's Heroes. 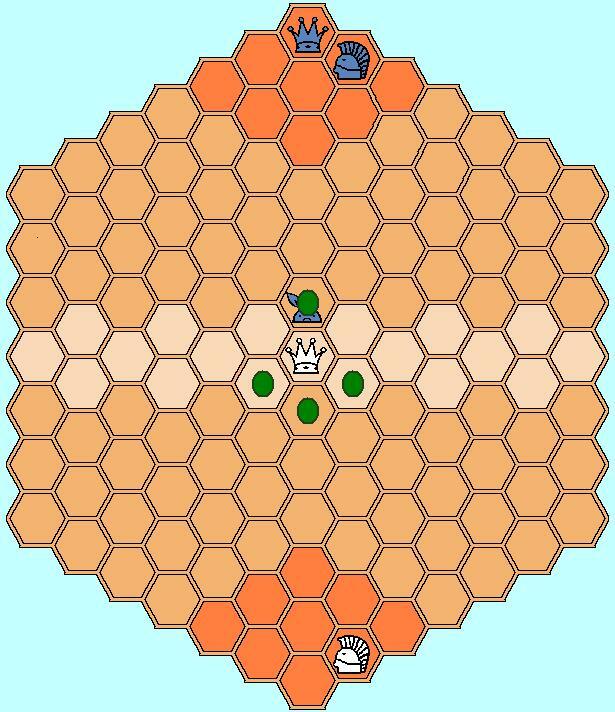 You also win if your King enters the opposing promotion zone (the four hexes at each end of the board). Checkmate is retained as a traditional Chess feature. 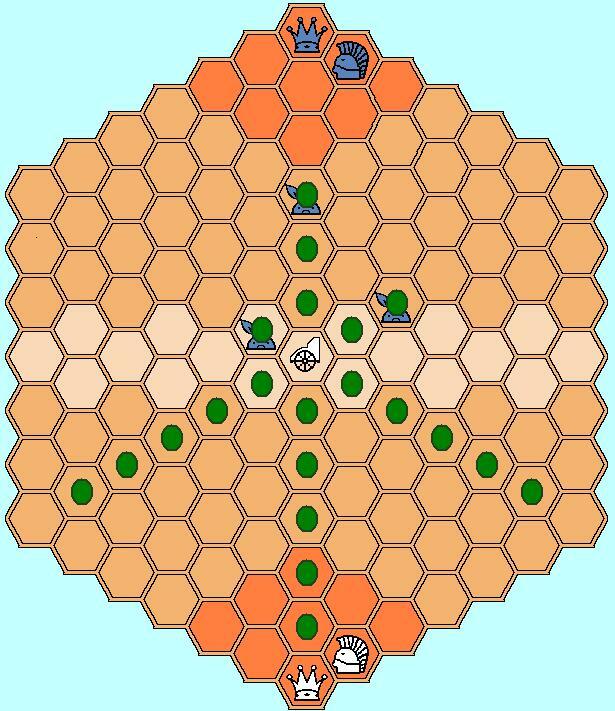 However, I added the condition that one also looses if all of one's Heroes are captured, or if the enemy King reaches the promotion zone on one's side of the board. The idea is that the Hero is a piece that is royal in this game. One could think of it as a prince. If a King looses all his princes, he is lost! Also if the enemy King reaches your stronghold, you are also lost! In practice, I have found that it all these victory conditions can occur. Movement and Capture: Unless stated otherwise, these moves are typical Chess-type moves, where the piece captures any opposing piece that it lands upon at the completion of its move. I also have a Zillions of Games ZRF that I will post, as well as sample games in Zillions. Any comments are appreciated. Enjoy the game!